This young man is the perfect example of everything we hope to achieve at Ameena Project. Kennedy was one of our first students and finished the program successfully to enter the local school system healthy, eager, and ready to learn. Today, Kennedy earns a nearly perfect score on his annual school exams, ranking him at the top of his class each year. The eldest of seven children in his family, Kennedy has overcome insurmountable barriers and is solidly on his way to becoming everything he was made to be. His little sister Zainabu is following in his footsteps at Ameena Centre and building the foundation she will need to thrive. Kennedy’s mother is mentored by our staff and they are helping her build skills for home improvement and financial planning. She now works in our kitchen several days a week to supplement her income. Watching her children come alive to health, opportunity, and education is now a reality that Kennedy and Zainabu’s mother had never dared to dream possible. One day, Kennedy and Zainabu will change the world for others, as you have changed the world for them. Kennedy is the perfect example of everything we hope to achieve at Ameena Project. Five-year-old Ameena Centre student Isaac had missed several days of class when the staff when to check on him one morning. When they arrived, they found Isaac near the body of his dead mother, who had suffered from an untreated abscessed tooth. The infection had spread to her tonsils, causing swelling and blockage that caused her to die by suffocation. Our teachers moved quickly to unite Isaac with his grandmother, who cares for him today. This is life in Kiang’ombe, and while people grieve, they also have to keep on with the rhythm of life. Ameena Centre helps lighten that load by providing sustenance and a safe harbor for children like Isaac who face unimaginable challenges at home. Ameena Centre helps lighten the load by providing sustenance and a safe harbor for children who face unimaginable challenges at home. 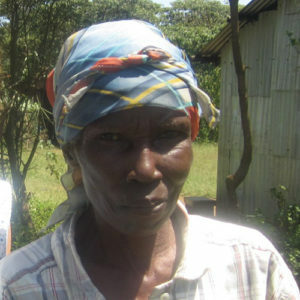 Gakuo is a village elder in Kiang’ombe. He’s lived there so long that he is a household name. Many years ago, Gakuo was severely injured in a vehicle accident and not being able to afford medical care, he was left with disabling injuries. Up until recently, he was entirely dependent on the Kiang’ombe community for survival and spent his days shuffling from house to house seeking his daily sustenance. Kind friends of Ameena Project provided custom orthotic shoes for his injured leg which enabled him be more mobile and wear shoes on both feet for the first time. 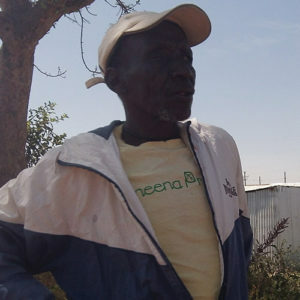 In the early years of Ameena Centre, Gakuo visited the program every day to make sure the kids and staff were doing okay, and he became an outspoken supporter of the program throughout Kiang’ombe. He encouraged reluctant families to bring their children to school and helped parents overcome cultural and social barriers to education. In 2017, Gakuo accepted a position at Ameena Centre as a part-time reliever to fill in gaps in staffing, and is an enthusiastic supporter of the program, coming to work every day with obvious pride and a smile on his face.